Thanks to those of you who have tried out the preview draft version of the How the Economy Works Visual Tutorial and submitted feedback! (And thanks Tom for the extra traffic from your post). I have created a dedicated blog for EconViz.org on which I'll announce major content and functionality updates to that site. Feel free to subscribe to the RSS Feed if you are interested in seeing what unfolds there and perhaps giving further feedback. So far there are two posts -- an introduction, and the results of the mini-survey I included at the end of the tutorial. My goal is to keep up occasional posts on this blog on macroeconomics topics outside of concept visualization -- hopefully more frequent than they have been recently! But neither will be a high volume blog any time soon. Public Service Announcement for Google Reader users: If like me you were driven crazy by the huge amount of wasted screen space in the "refresh" to Google Reader a few weeks ago, I recommend the Google Reader Demarginfier script (works with the Greasemonkey browser add-on). As previously mentioned, I've been gradually working on a new MMT-inspired visual tutorial on how the economy works. (It is completely separate from the macroeconomic balance sheet visualizer). My hope has been that integrating an animated flow diagram alongside the verbal explanations would make the concepts accessible to a broader audience than those willing to read and digest a typical MMT blog post. I have a partial "proof of concept" working, though it's still too rough, ugly, and incomplete to release into the public wilds of the internet. someone who is learning MMT and still trying to get up to speed on the core concepts. There are two high level ways that borrowing occurs in the private sector — bank loans, and all other forms of borrowing, i.e., bond issuance, securitization, peer to peer lending, etc. When there is an "excess" of short duration assets (primarily money) held by the private sector, the holders of those assets will be eager to lend it out, and thus acquire a higher yielding asset. 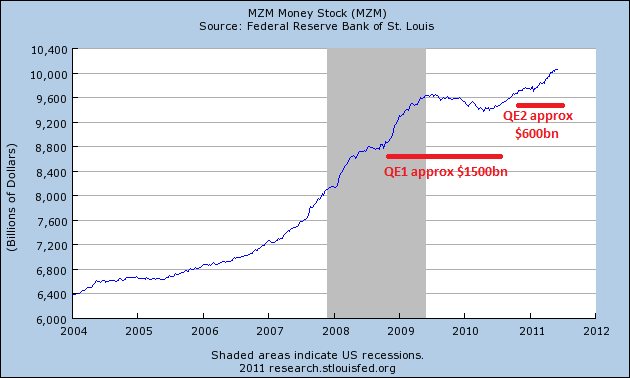 The money supply remains unchanged. 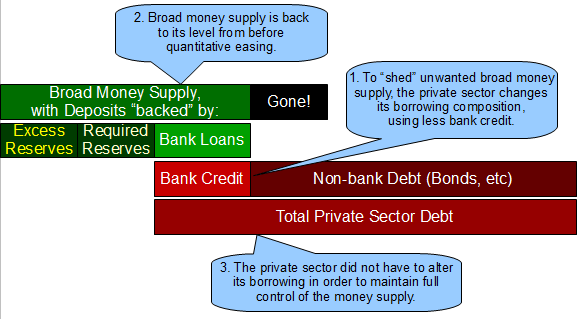 When there is no "excess" of money to lend (i.e., portfolio preferences are satisfied with the current levels), then banks will have a higher propensity than non-bank lenders to fulfill the economy's current borrowing needs, because they can lend an [almost] unlimited amount, independent of their level of money/reserves. (Their only limit on lending to worthy borrowers, and it is temporary, is how much equity capital they can raise). Bank lending increases the money supply, so from a macro perspective, banks could be considered the private sector's lender of last resort. 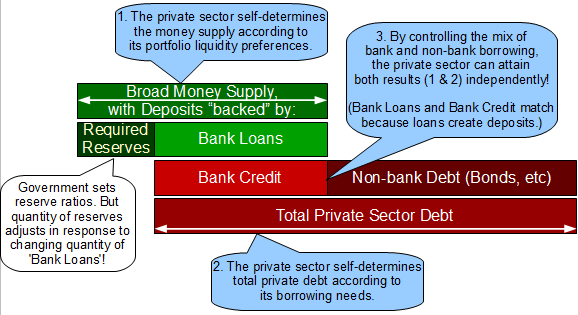 By choosing the relative proportion of the two type of borrowing, the private sector is able to choose its portfolio mix of long duration assets and short duration assets (money), independently of the actions of the federal government, and [mostly] independently from the desired level of private sector borrowing! 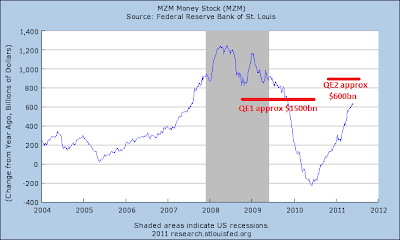 When the Federal Reserve conducts Quantitative Easing, it buys long duration assets (treasury bonds, etc) out of the private sector, and gives the private sector short duration assets (money balances) instead. If the private sector is not happy with this new portfolio mix resulting from QE, it likely has the power to "undo" the change over time via shifts in the proportion of bank loans versus other types of lending that it uses! If the balance sheet impacts of bank lending, non-bank lending, and quantitative easing are not familiar to you, please play with the Macroeconomic Balance Sheet Visualizer — it is a graphical web-based tool, now with a step-by-step walk through mode. "...for apparently the demand for money and the supply of credit are determined by two independent mechanisms. In the Lavoie and Godley (2001-2002) model for instance, the demand for credit, at the end of the period, depends on the part of investment expenditures which has not been financed by retained earnings and new equity issues..."
"...the decision by households to hold on to more or less money balances has an equivalent compensatory impact on the loans that remain outstanding on the production side." While Lavoie only mentions "equity issues", I have seen evidence elsewhere that he uses that term as shorthand to describe any non-bank borrowing mechanism employed by a firm, i.e., his reference to "equity issues" is supposed to also encompass bond issues and some other types of liabilities. 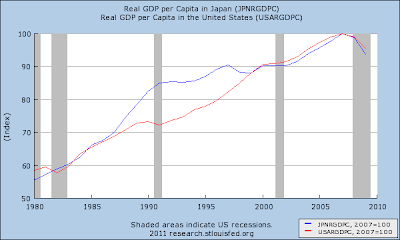 In the last post on this topic, I showed a graph of Japan's bank and non-bank borrowing. While inconclusive, it suggests that Japan's Quantitative Easing from 2001-2006 may have caused a relative decrease in bank-based borrowing as compared to non-bank borrowing, which could add to evidence of the theories above. 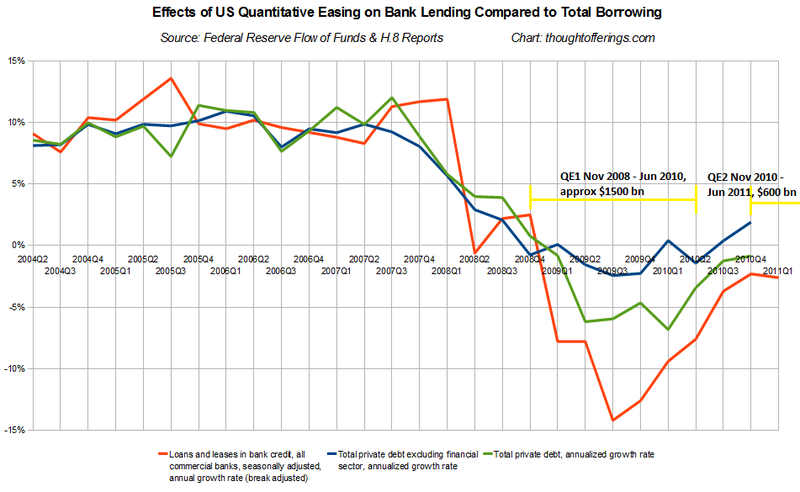 Below is a graph of US borrowing from Q2 2004 to Q1 2011. The red line shows the annualized percentage change in bank loans and leases, by quarter. The green line shows the annualized percentage change in total private sector debt (from the Z.1 report, which is not yet available for Q1 2011). 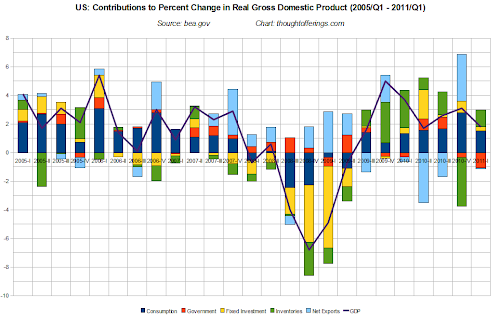 The blue line shows the annualized percentage change in non-financial private sector debt (since the private sector's debt has many layers that could overwhelm the other trends, I thought it worth separating financials out.) I have not subtracted bank loans out of the total debt data, so the shape of the blue and green lines is slightly impacted by the shape of the red line (though the absolute amount of bank debt is around $7 trillion versus around $41 trillion for total private sector debt, so crossover impact is not huge). 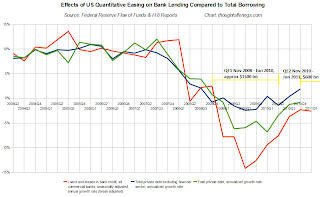 Notice how bank loans declined substantially faster than total debt after the first round of Quantitative Easing started! 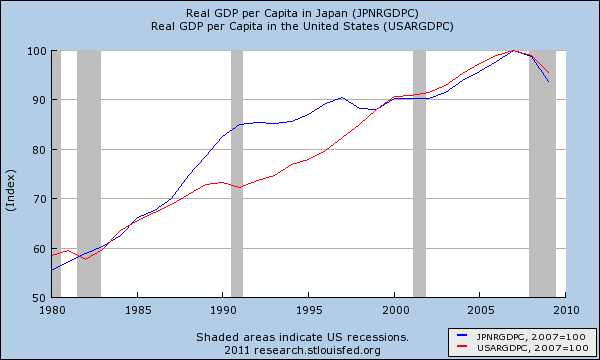 The gap between the red line and the blue line is probably the most relevant. Despite tracking closely to each other until late 2008, they diverged significantly starting in 2009, perhaps as the private sector favored non-bank lending on a relative basis over bank lending, in order to "shed" the excess money supply imposed by quantitative easing! 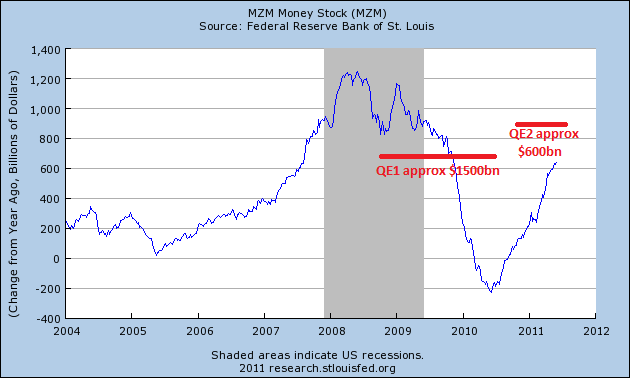 The second round of quantitative easing is smaller in magnitude, and the data so far only covers the start of QE2. 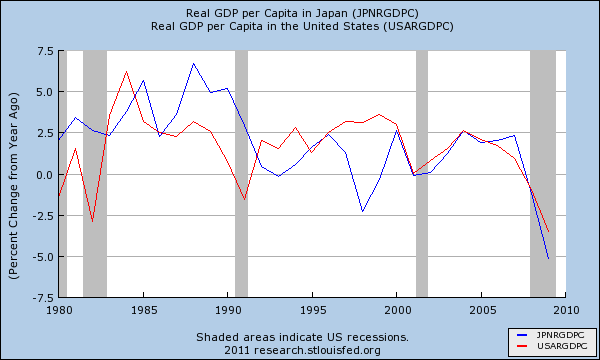 However, in Q4 2010 the gap between the red and blue lines appears to begin widening again. Will that effect continue? I would guess so, but I could ultimately prove to be wrong. It is also not clear how big the lag effects in this process are. Also, the changes in bank loans versus total debt diverged most significantly in the middle of QE1, and the gap narrowed partially before QE1 ended. It could be that other dynamics that I am unaware of provide a more accurate explanation than what I suggest here. Junk Borrowers Turn Tables on Investors With Looser Terms: Credit Markets: "...debt sold this week included a condition that allows the company to call 10 percent of the bonds at 103 cents on the dollar in each of the first four years... [The borrower] is trying to lock in low interest rates while getting the flexibility to repay debt any time, as it would with a loan..."
In generating the chart in this post, I discovered the importance of using the percent change bank loan data as prepared by the Federal Reserve in its H.8 release whenever possible, instead of starting with the absolute levels of loans. The latter's level jumps around too much due to balance sheet consolidations, acquisitions, etc, while the percent change data appears to be adjusted to remove this effect, if I am understanding it correctly. Details are on the about page and notes page. 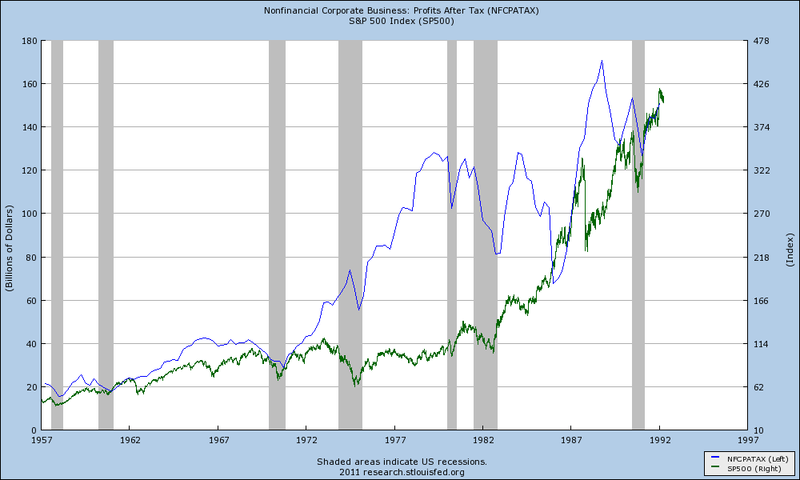 Nonfinancial Corporate Earnings: Could They Keep Falling Until the Economy Passes Through Another Recession? 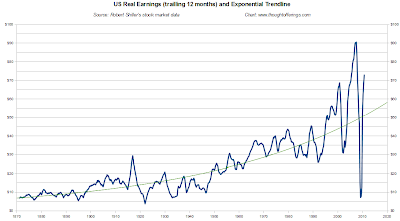 While I ponder aloud whether this is a healthy stock market for investors (as opposed to momentum traders), this will be my second post on the topic, following the last post that graphed long term trends in earnings. I tend to avoid analyses that take the form of "whenever A happened in the last B years, then C occurred at least D percent of the time." Much of the time this indicates data mining to validate a favored conclusion, whether bullish or bearish. While this post risks getting closer to that territory than I'd like, I'm going to avoid actually calculating percentages and such and keep it vague and qualitative! I have no clear conclusions, I simply found the data interesting. 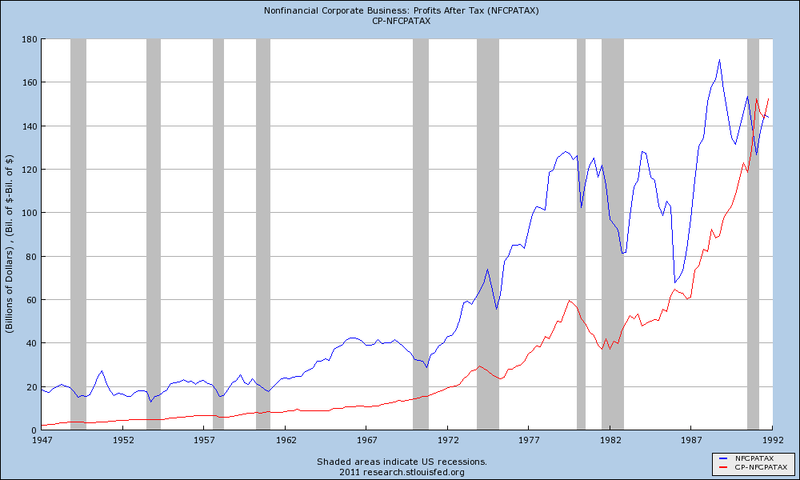 Here is a graph of nonfinancial corporate business profits after tax (NFCPATAX) and financial corporate business profits after tax (CP minus NFCPATAX) from the national accounts data, generated via FRED2. 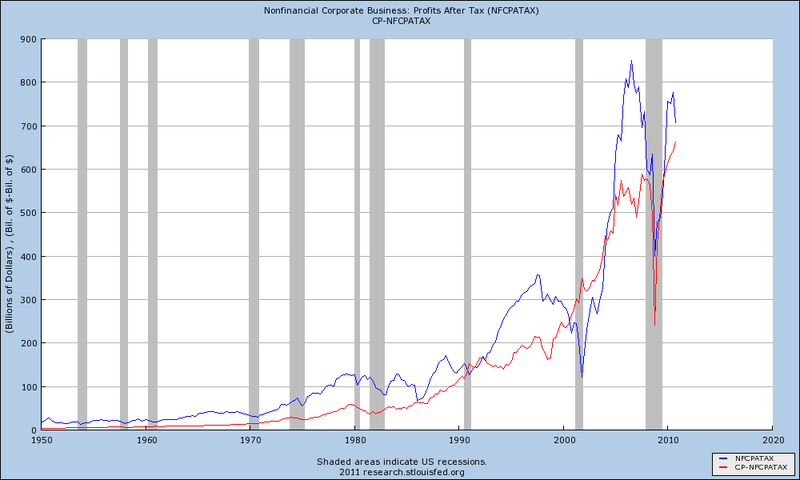 Nonfinancial profits (the blue line) fell a nontrivial amount in Q4 2010. Have they peaked for this expansion? Or was there a special one-time event (such as an expiration of tax-friendly legislation) that explains it? Look at the historical pattern of past occurrences of nonfinancial profits first starting to fall. 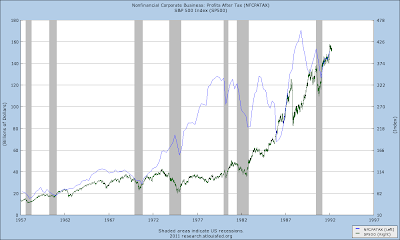 If the drop was nontrivial in size, nominal nonfinancial profits continued to fall and only reversed course once a recession had occurred and was reaching its end! This process seemingly can take several years to occur (e.g., especially in the late 1990s). The most obvious exception to the pattern is in the mid 1980s — a large drop in earnings was later followed by resumed earnings growth, with no recession. 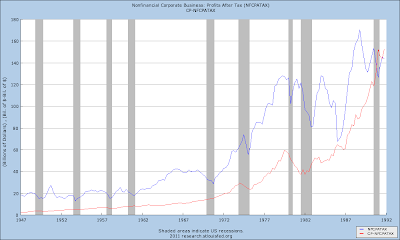 Financial profits (the red line) in the period leading up to and through recessions have acted quite differently than nonfinancial profits. 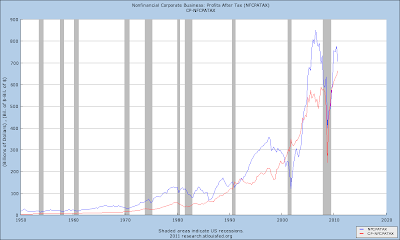 In the 1991 and 2001 recessions in particular, financial profits kept growing, largely unfazed by recession! This perhaps had a lot due to with the rapid growth in household debt as well as the steeper yield curve due to the Fed lowering rates. 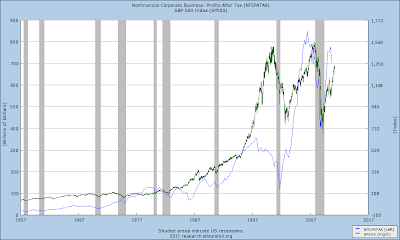 The pattern of nonfinancial profits peaking in nominal terms months or years before recession occurs seems similar but less pronounced than in the later periods. 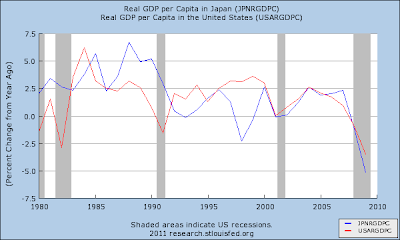 Note that I am intentionally graphing nominal profits in all cases, rather than a ratio such as to GDP. This is because stock prices are likely more sensitive to nominal profits than profits ratios. A natural question for an investor would be, what are the implications for stock prices? Does the point at which nonfinancial earnings peak represent an "overvalued" stock market price, given that recession often follows within a few years? It appears that in many cases, the stock market continued to rise after earnings peaked, and the eventual stock market low during recession wasn't always lower than the stock price had been at the time of that prior peak in earnings. Thus, waiting to buy stocks wouldn't necessarily have provided a lower entry point in the future. There are of course exceptions, for example the most recent recession taking stock prices well below their price at the time of the prior peak in nonfinancial earnings. I can suggest no insights from this data regarding the eventual impact on stock prices even if the current contraction in nonfinancial earnings continues. The future direction of financial sector earnings may turn out to be a key determinant of the outcome. Plus, as is well known, valuation multiples expand and contract independently from changes in earnings. Stock Market Earnings Trends: What Happens This Decade? What is the outlook for US stock market returns over the coming decade? There is no shortage of commentary on this topic, and I don't have any unique answers, but I thought I would share two graphs. A lot of market commentary suggests the stock market is overvalued on the basis of measures such as stock market capitalization to GDP, Shiller's CAPE (10 Year Average Inflation-Adjusted PE ratio), Tobin's Q, etc. But for any elevated ratio, a reversion to the mean can occur via a combination of falling numerator and/or rising denominator. For example, GDP could grow rapidly while stock market valuation grows slowly, allowing the ratio of market cap to GDP to mean revert without a fall in earnings and stock prices. But how likely is the numerator to fall? That is what would most concern a medium to long term investor. One prediction in particular that caught my attention was Robert Shiller's suggestion that the S&P 500 will be around 1430 in the year 2020. With the S&P 500 currently around 1300, that represents roughly a 10% total increase (not annual!) over a decade. Robert Shiller is known for recognizing both the dot-com bubble and housing bubble long before most people, so he is worth listening to. The green exponential trend line shows the long term earnings trend. Current earnings have rebounded quickly to well above the trend line. If earnings oscillate around this trend line as they have done historically, they should be centered around roughly $60 in 2020! At a 15 valuation multiple, that only represents an S&P 500 index value of 900 (a 31% decline!) 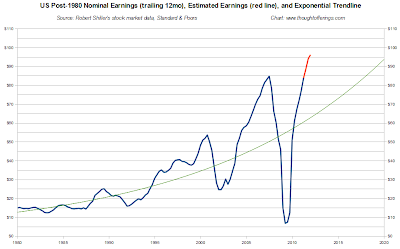 However, this trend is for real (inflation adjusted) earnings, so the nominal level of earnings and corresponding S&P 500 valuation would be somewhat higher assuming continued positive inflation. But what about the most optimistic case from the perspective of the stock market? What if we are in a sustainable new era in which the recent extraordinary corporate margins, earnings to GDP, etc, can be maintained indefinitely? 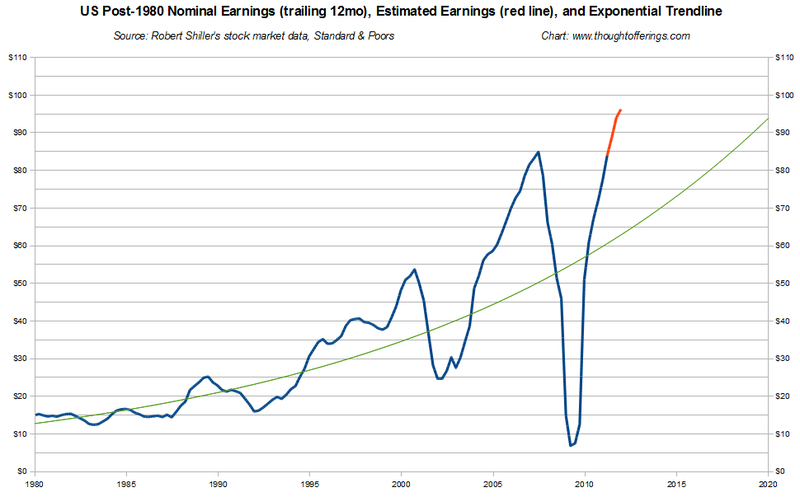 The next graph shows the same trend line since 1980 but for nominal reported earnings. The red portion of the line is the estimated forward earnings from Standard & Poors S&P500 spreadsheet as of today, which is important because expected earnings represent what the market valuation is currently priced for, i.e., earnings of $90-$95. This trend line shows the nominal earnings trend reaching the $90-$95 level around 2020. So current earnings and forward estimates are ten years ahead of "schedule"! This second graph seems to align with Shiller's suggestion of an S&P index of 1430 in 2020 (with a 15 valuation multiple, earnings would be $95). The key question for a stock market investor is what happens to that earnings line over the next decade: does it remain above trend line (not impossible, if you look at the late 1990s period), does it crater again as in 2008-2009, or does something else occur? This graph shows the extent to which nominal earnings can fall: a 35% fall from 1989-1991, a 54% fall from 2000-2001, and a 92% fall from 2007-2009 . So history shows that a falling numerator is not uncommon, i.e., reversion to mean not exclusively driven by a rising denominator. If falling earnings is a reasonably probable scenario, the next question is, when? With labor cost pressures low and held down by high unemployment, and rising commodities costs representing a possibly more manageable percentage of most cost structures, is a contraction in GDP the only thing that could meaningfully reduce earnings?